For information for the Taste History Culinary Tours of Historic Palm Beach County, click here. The culinary tours in Delray Beach & Boynton Beach, Lake Worth & Lantana; and West Palm Beach/Lake Worth are offered for private groups and for the general public. The general public culinary tours are offered on Saturdays. The Narrated Bus Tours of Historic Palm Beach County are now ONLY offered for private groups. Some of the cities available for these heritage tours are Delray Beach, Boynton Beach, Lake Worth or West Palm Beach. It will be a delight to host your group. Please call us at 561-638-8277. Therefore, all public tours held on Saturdays are the cultural food tours, effective December 17, 2011. The Narrated Bus Tours of Historic Delray Beach are now ONLY available for Private Group Tours helding during the weekday. A minimum of 20 people are required and the tour can take a maximum of 45. For rate information and to schedule a private tour call: 561-638-8277 or e-mail info@mlfhmuseum.org. Please Note that this tour is NOT the food tour. To schedule a private tour call: 561-638-8277 or e-mail info@mlfhmuseum.org. Please Note that this tour is NOT the food tour. 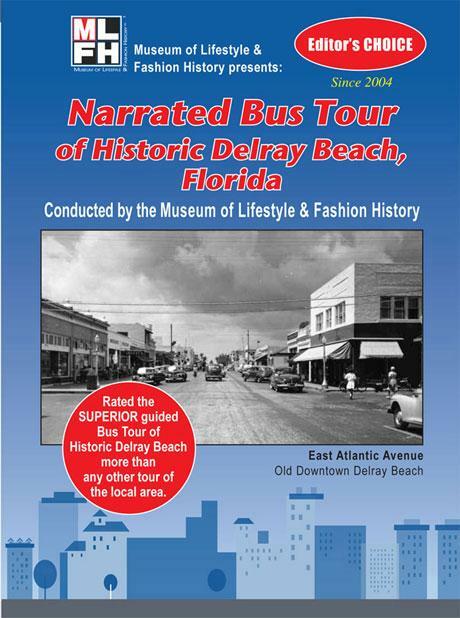 Please Note: The Narrated Bus Tours of Historic Delray Beach are still available for Private Group Tours. The Narrated Bus Tours of Historic Delray Beach are NOT the Taste History Culinary Tours. For more about the Narrated Bus Tours read the following information on this webpage. The Narrated Bus Tours of Historic Delray Beach are held on the 4th Saturday of each month, year-round. These tours allow people to discover historic sites through public access as part of the tours� visits to historic buildings in Delray Beach, Florida ( Palm Beach County). The importance of historic preservation is evident and emphasized during the tours. In addition to local history and the origins of Palm Beach County, the history of the State of Florida is also included in the narration during the tour with information about the arrival of Spaniards in the 1500s as well as the migration of runaway African slaves and Creek Native American slaves who came to Florida together from the late 1600s to 1800s. The narrated local history is told as the bus travels through historic areas such as Swinton Avenue which was na　med for one of Delray Beach�s early white settlers named David Swinton, from Saginaw , Michigan who owned a book store in Saginaw. He came to this area in 1894 on a trip with his friend named William S. Linton, a Michigan Congressman. In 1894, Mr. Linton purchased 160 acres of land and made a down payment on 640 more acres in this area and he named the town after himself and called it the Town of Linton which later was named Delray Beach. Soon after his purchase, Mr. Linton began recruiting others from Michigan who began the task of settling and laying out the town. The tour information explains more about other tidbits of facts about the people, places & lifestyles of Delray Beach in the early years. The tour also highlights the Historic West Settlers District which is the African American historic district in Delray Beach that recognizes the early African American settlers of Delray Beach who were already in Delray Beach before the white settlers arrived. African Americans lived in the area West of what is now called Swinton Avenue. Other historical facts that are featured as a part of the tour are about the Japanese settlers who were recruited to Delray Beach in the early 1900s by railroad tycoon Henry Flagler. The Museum of Lifestyle & Fashion History offers Historic Preservation tours with mathematics and geometric shapes infused for children and school groups. The tours are available for all age groups. Please contact the Museum for more about subsidized rates for these group tours. Sponsorship opportunities are available and are much needed to help support the cost of the bus rental and the activity workbooks that are provided for the children. In the Frog Alley district is the newly designed sidewalk/streetscape by Miami artist Gary Moore. In year 2006, AAA Travel Mid-America Home & Away Magazine designated the MLFH Delray Beach bus tours as the �Most Unique Travel Gem�. Some of the other prestigious national accolades that the Museum�s bus tour program has received include being selected as the �Best� by the Guest Informant Magazine-Gold Coast edition; the Palm Beach Post, Sun-Sentinel, the Boca News and the Delray Forum, to name a few. The Museum�s bus tours also received an �A+� rating by the San Antonio Press newspaper of San Antonio, Texas in a December 24, 2007 travel column blog. The Narrated Bus Tours of Historic Delray Beach was voted for a second time, as the 2008 Best Tour of The Town by Gulfstream Media Group who are publishers of Boca Life Magazine, The Palm Beacher Magazine and Gold Coast Magazine. The first recognition from the Gulfstream Media Group for the Museum�s bus tours as being the �Best� was in year 2006. If you require wheelchair access for the bus/or sign-language interpreter for the hearing impaired, a minimum 2 months notice is required so that a wheelchair access bus can be reserved and/or a sign-language interpreter scheduled. No additional fees are charged for this service. More about the bus tours. In addition to local history and the origins of Palm Beach County, the history of the State of Florida is also included in the narration during the tour with information about the arrival of Spaniards in the 1500s as well as the migration of runaway African slaves and Creek Native American slaves who came to Florida together from the late 1600s to 1800s. The narrated local history is told as the bus travels through historic areas such as Swinton Avenue which was named for one of Delray Beach's early white settlers named David Swinton, from Saginaw, Michigan who owned a book store in Saginaw. He came to this area in 1894 on a trip with his friend named William S. Linton, a Michigan Congressman. In 1894, Mr. Linton purchased 160 acres of land and made a down payment on 640 more acres in this area and he named the town after himself and called it the Town of Linton which later was named Delray Beach. Soon after his purchase, Mr. Linton began recruiting others from Michigan who began the task of settling and laying out the town. The tour information explains more about other tidbits of facts about the people, places & lifestyles of Delray Beach in the early years. The tour also highlights the Historic West Settlers District which is the African American historic district in Delray Beach that recognizes the early African American settlers of Delray Beach who were already in Delray Beach before the white settlers arrived. African Americans lived in the area West of what is now called Swinton Avenue. Other historical facts that are featured as a part of the tour are about the Japanese settlers who were recruited to Delray Beach in the early 1900s by railroad tycoon Henry Flagler. The Museum of Lifestyle & Fashion History�s Narrated Bus Tours of Historic Delray Beach were selected for the 2nd consecutive year as one of the Best Bets in Palm Beach County in the 2006 Guest Informant Magazine for the Gold Coast Edition of Fort Lauderdale and the Palm Beaches. The Guest Informant is a hard-cover magazine distributed to hotel rooms in major hotels. When the Museum of Lifestyle & Fashion History tours began in 2004, they were the only tours of historic Delray Beach conducted on an on-going, year-round basis and they are still the only tour series conducted 12 months a-year. In 2006, the Museum�s tours were also selected as Best Tour of The Town in the June 2006 issue of The Palm Beacher & Gold Coast Magazines; in 2005 and 2006, these bus tours were selected as Best Bets in all of Palm Beach County in the Gold Coast Edition of the Guest Informant. The Narrated Bus Tours of Historic Delray Beach were also selected in 2006 as one of the �Unique Travel Gems� by AAA Home & Away Magazine Mid-America publication for the States from Ohio to Alaska and the tours were profiled in the January/February 2006 issue of Home & Away AAA Magazine of Mid-America. A certificate for this honor was sent to the Museum of Lifestyle & Fashion History for its bus tour program. These monthly bus tours are hugely popular. There are 10 historic sites for tour stops which are visited on a rotating basis where the bus makes stops so that passengers are allowed to get off the bus and go inside to view the inside of that particular historic building and learn more about its history and its important role in the history of the settlement of the community of Delray.